Ivan Obolensky’s Eye of the Moon is a house party mystery much in the style of Agatha Christie—without the body. Percy is persuaded by long-time friend Johnny Dodge to return to the Dodge estate on the Hudson River to celebrate Johnny’s parents’ anniversary. Also invited are Johnny’s grandmother “Maw” Leland, his step-aunt, Bonnie, John Sr.’s friend Baron von Hofmanstal with his wife and daughter Brunhilde, and hanger-on Malcolm Ault. Raised by the family, Percy has never felt part of it, except around Johnny’s Aunt Alice, who died under strange circumstances. His misfit feelings intensified after Johnny and Percy’s successful financial trading company suddenly failed; Percy feels responsible. During the weekend, Aunt Alice’s dark dabbling in the occult is revealed by—who else?—the butler, Stanley. Johnny and Percy summon a demon to find out if Alice was murdered. Percy falls for Brunhilde and discovers multiple truths about his background. Family antagonisms explode. Most of the action takes place before the story starts, so the characters need time and space to retell the tale to each other: Johnny outlines his fall from grace to Percy; Butler Stanley spends a night revealing Alice’s history, and so on. This structure slows the story significantly, though this isn’t necessarily bad. Readers have time to get to know the characters and the lifestyle they’ll do so much to protect. It’s like having brandy and a cigar in the library with Lord Peter Wimsey rather than confronting bad guys a la Kinsey Millhone. In fact, although the story is set in the U.S. in 1977, the narrative voice is much like a 1930s-40s British mystery—so much so that when a character says his brain is “fried,” it’s jarring. There are a few too many plot lines here, and Obolensky doesn’t always pull them together in satisfying ways. The ending is far too pat. 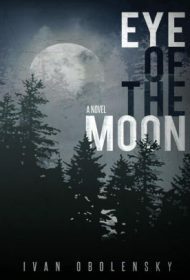 Nonetheless, Eye of the Moon’ s intriguing characters and interesting twists deliver an engaging, enjoyable read.